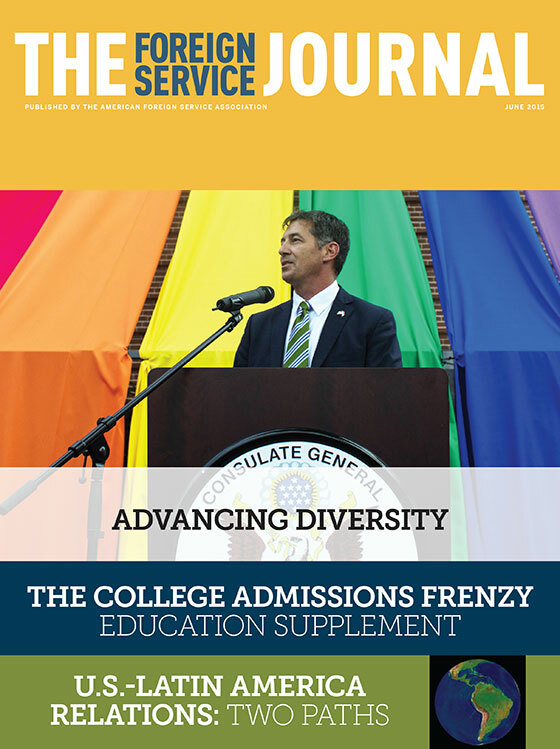 The June issue explores progress on diversity and inclusion, with a special emphasis on LGBT+ rights in the Foreign Service and across the foreign affairs agencies. The issue features and in-depth Q&A with the new—and first ever—Special Envoy for the Human Rights of LGBT Persons, career Foreign Service Officer Randy Berry. Selim Ariturk, president of GLIFAA (founded in 1992 as Gays and Lesbians in Foreign Affairs Agencies), presents an overview of the progress made by the Foreign Service LGBT community, and outlines the milestones which have yet to be reached. FSO Richmond Blake explains how the United States is folding LGBT considerations into its human rights policy agenda. FSOs Jennifer Zimdahl Galt and Thao Anh Tran reflect on how robust mentor-mentee relationships can help sustain diversity into the top ranks of the Foreign Service. FSO Lia Miller credits the Pickering and Rangel fellowship programs for having attracted first-rate candidates with diverse backgrounds to our diplomatic ranks, but raises concern about retention. Ambassador Michael Guest speaks out on how the foreign affairs agencies can remain competitive with corporate employers by expanding, rather than backsliding on, their support for unmarried partners of all diplomats. Finally, the issue provides a look at the many affinity groups at the foreign affairs agencies and the important role they play in enhancing diversity and promoting inclusion. Elsewhere in the issue, AFSA President Bob Silverman recounts examples of Foreign Service leadership, and finally, the June issue contains our semiannual education supplement. This edition examines the insanity of college admissions and the possibilities offered by taking a gap year. Protecting the existence and rights of the LGBT community has become a core issue in the U.S. human rights mission worldwide. With significant successes to celebrate, GLIFAA is broadening its reach in the campaign for full equality for LGBT individuals. The progress of LGBT rights in Europe and the Americas has elicited a backlash in other parts of the world. Strong U.S. leadership can help reverse this alarming trend and mitigate the threat of widespread violence. It is one thing to recruit a diverse workforce; it is quite another to sustain that diversity into the senior ranks and reap the benefits. Mentoring is one of the keys. Two innovative programs—the Thomas R. Pickering Fellowship and the Charles B. Rangel Program—have helped bring diversity to the Foreign Service, but challenges remain. It’s not easy to keep one’s footing through the college admissions frenzy. In his new book, journalist Frank Bruni offers perspective and balance that can help ease the process. Gap years are becoming more popular in the United States as a transition to college. Here’s one Foreign Service student’s experience.